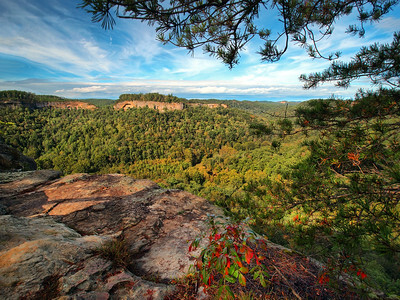 Located in the Daniel Boone Nation Forest, RRG is a popular hiking and climbing destination. 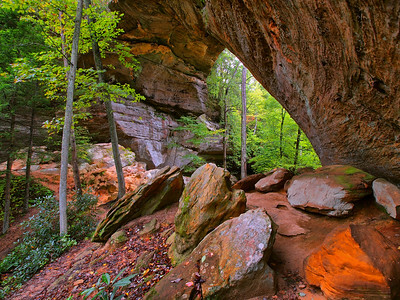 It is loaded with arches, waterfalls and cliff side vistas. 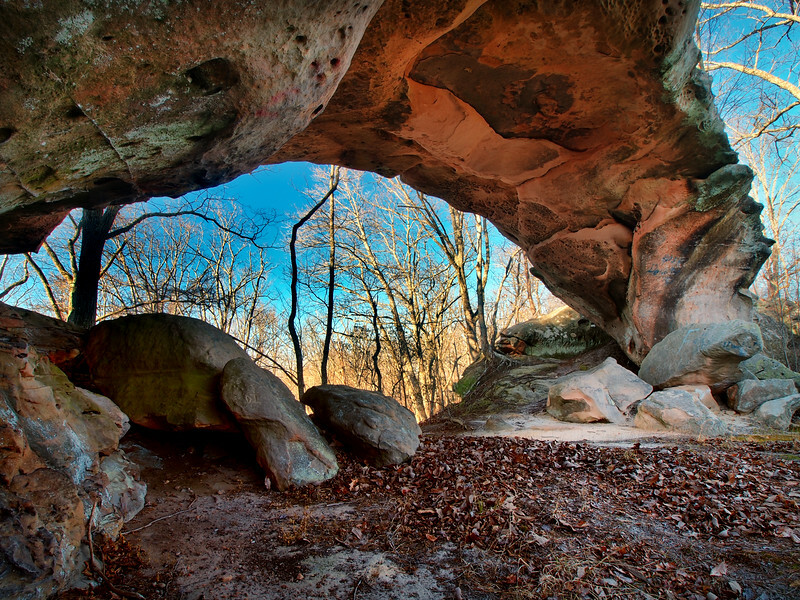 This Gallery also contains surrounding parks within an hours drive. 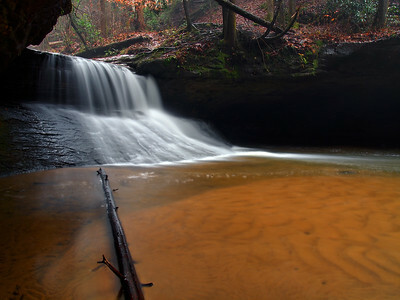 Bell Falls Unnamed Branch Red River Gorge Geological Area Daniel Boone National Forest Kentucky When I first began getting into waterfall photography one of the earliest waterfalls I shot was Bell Falls in Kentucky’s Red River Gorge. At time I was like “Oooooo, waterfall” and I got some mediocre shots of the falls that at the time I loved. 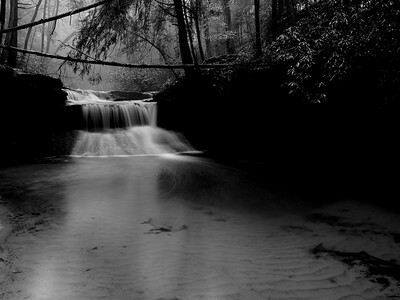 That was the only time I had ever shot that waterfall until a couple weekends ago. Myself and good friend Nathan Schertler made the trip down to The Gorge to check out some new things and some old things. There had been a lot of precipitation over the last couple weeks so the Red River was up and water was falling roadside everywhere. As we passed Bell Falls it was the best I’d ever seen it, but there was direct sunlight shining into the little grotto it flows through so I thought it would be a good idea to return later. After making the trek to the waterfall on Copperas Creek there was still about a ½ an hour of light when we got back to the car, hopped in and made a b-line to Bell Falls. By now the sun was off the falls and it had gotten pretty dark in there. I got off a handful of comps before calling it quits since I was getting into 50 second exposures and light was becoming scarce. I really wish we had arrived about 20 minutes earlier, not only did I have some other ideas to shoot the main falls but I wanted to visit Upper Bell Falls which I had never been to and it isn’t far upstream. Nonetheless I got a couple of the main falls I did like, I just hope it doesn’t take another 10 years for the opportunity to stop by here after a major rain event. 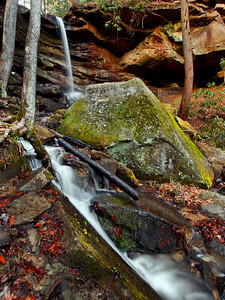 Copperas Creek Falls Copperas Creek Red River Gorge Geological Area Daniel Boone National Forest Kentucky One of the things I discovered when I recently visited Copperas Creek Falls in Kentucky's Red River Gorge is that when making the 2 1/2 mile trek back there it should be done on a cloudy day, at least for me. When we arrived at 3:20 in the afternoon the sun was just off the falls and by time we left at 4:20 the sun had just moved off the cliff to the right, making for some tonal issues for the camera. As I studied the surroundings it was obvious that the falls is in full sunlight nearly all day long. 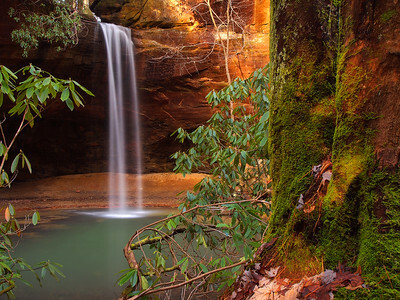 In my opinion, this area of RRG is truly one of the more beautiful areas in the state, at 40 ft tall the falls has a sandstone recess behind it and large boulders beneath each side of the cliffs. The hike in is just gorgeous and it's fun too, even though there's not much elevation change the hike is a physical workout with many easy to conquer obstacles. Oh, and there's some side trails that will take you to some natural arches, but I've heard those are bit more strenuous to hike to. 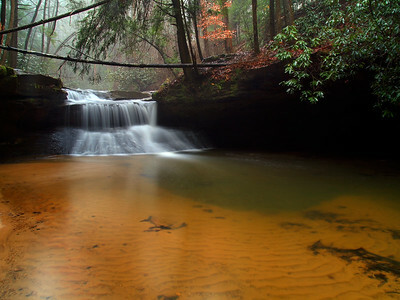 Copperas Creek Falls Red River Gorge Geological Area Daniel Boone National Forest Menifee County Kentucky One of Kentucky's sweetest waterfalls is Copperas Creek Falls, at 40 ft tall it is deep into Kentucky's Red River Gorge Geological Area in the Daniel Boone National Forest. A little under 5 miles, the round trip off trail hike to the falls is a good workout. I'm hoping for a return trip soon, it takes a nice rainfall to get this falls going and it's well worth getting your feet wet to spend some time with one of the states best! 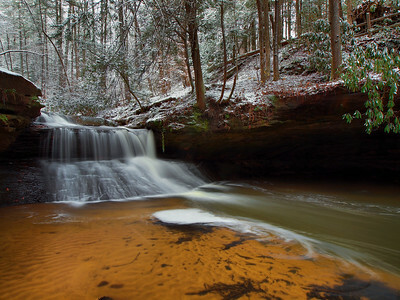 Copperas Creek Falls Copperas Creek Clifty Wilderness Red River Gorge Geological Area Daniel Boone National Forest Kentucky Back in the early spring of 2018 myself and good friend Nathan Schertler made a day trip journey to Kentucky’s Red River Gorge in the Daniel Boone National Forest. I hadn’t fully decided on where to go yet because it was a sunny day with no clouds. 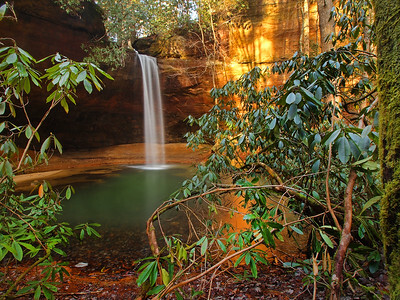 After stopping by the 1st stage Baby Arch, Underworld and the in-the-process Great Arch, we decided to make the hike back to Copperas Creek Falls. I had been to the falls two times in the past, 4 and 5 years ago, back when hardly anyone knew of the remote waterfall, so when Nathan and I started the trail I was surprised to see how things had changed. It had become a freeway. What once looked like nothing more than a deer path was now an easy to follow well worn trail. At first I was pretty concerned about making the 4 mile or so round trip hike, my knees had been bothering me badly all day and I started thinking to myself that I had made a mistake, but as the trail wore on my knees seemed to improve. I had never seen the water on the creek so high, there was no way to avoid getting the feet wet on this trek as there are at the least 10 creek crossings, some half way up the calf. I'll admit, half the fun is getting there as the hike is beautiful and really cleanses the soul. Upon our arrival this was the scene that had greeted us, I had planned the hike perfectly as the sun was just off to the right of the falls. 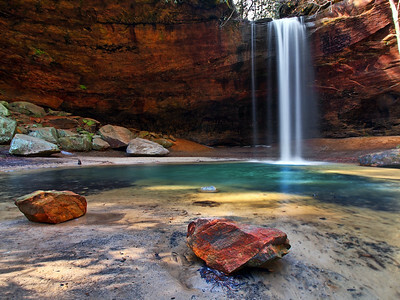 The waterfall plunges 40 ft over a large rock recess into an emerald splash pool and though I'm sure these two rocks in the foreground had been moved there by a human, it made for a gorgeous scene. Damn, I could just live out here forever. 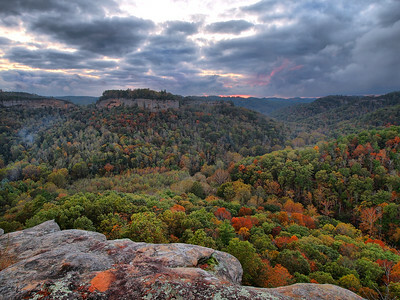 Chimney Top Overlook Red River Gorge Geological Area Daniel Boone National Forest Kentucky Normally I have a tendency to kill a sunset, I rarely capture one and today was no different. We were shooting at the nearby Princess Arch when the skies began to open up after a very cloudy/rainy day upping our hopes that we were about to see some epic light. Well, it wasn't so epic but what I did get I was really happy with. When we drove down we were thinking that we were going to have a lot of color change but to our amazement there was only about a 30% change. Even with sunset being a dud, the moody sky and scattered color really made my day. 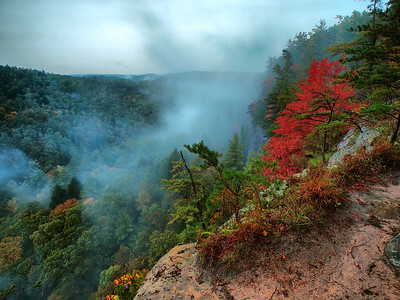 Chimney Rock Overlook Red River Gorge Geological Area Daniel Boone National Forest Kentucky The weekend this was taken was the first of many trips the fall of 2015 to Kentucky's Red River Gorge and of all the times I'd been to Chimney Rock I'd never been there in the morning, I was hoping for a fog filled valley but I knew that was wishful thinking. However, I wasn't disappointed. A beautiful blue sky against a forest on the edge made for a gorgeous scene, truly Red River Gorgeous. 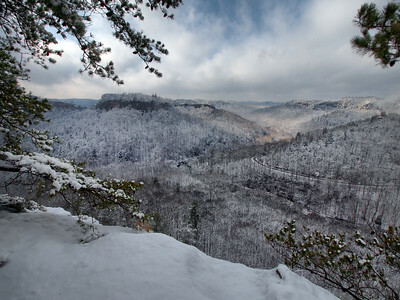 Chimney Rock Overlook Red River Gorge Geological Area Daniel Boone National Forest Kentucky It's hard to believe that it's been two years since Chris and I made a spur of the moment run down to Natural Bridge State Park and Red River gorge during a major snow event. Of all the years I've been visiting the area I've never been there when something like this has happened. We ended our day at Chimney Top Rock curious as to what the surrounding landscape looked like covered in a white blanket. Wow! What a beautiful scene! This is one of my favorite spots to capture sunset, just a short distance up the trail from the main overlook. 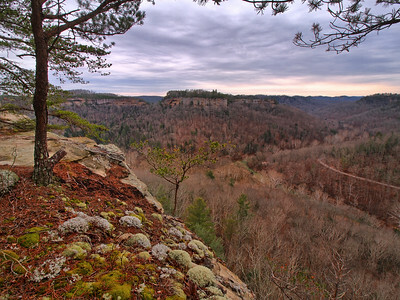 No sunset going on here, just a late afternoon scene looking out across Red River Gorge. I don't recall why but this was my last shot of the day, just as the sun popped out. Maybe the breezy cold air had finally gotten to my fingers and toes. It didn't really matter, it was a great day to enjoy winter. Devil's Canyon Overlook Red River Gorge Geological Area Daniel Boone National Forest Wolfe County Kentucky This past Saturday myself and my wonderful other half Lisa decided to drive the back roads from our home in Northern Kentucky down to Red River Gorge in Eastern Kentucky with the hope of shooting sunset from Chimney Rock. Well, things didn't go exactly as planned because when we arrived a thick cloud cover was hanging over the mountains and a light rain was falling. While shooting at the Gladie Historical Site we noticed fog was beginning to form midway up the surrounding mountains so we hopped into the car planning on hitting the several overlooks along the road to Sky Bridge. We arrived at the first overlook called The Devil's Canyon, exited the car and began to cross the road when we noticed that the brightest reddest tree we had seen on the entire drive was standing there at the end of the path on the cliff wall and there was fog all around. We never made it past this place as the fog changed and swirled all around painting a calm and soothing mood across the landscape. This was my last shot from here. As blue hour was setting in in it created a deep contrast against the prettiest tree I've seen all fall. 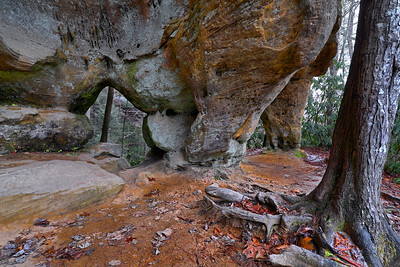 Double Arch Red River Gorge Geological Area Daniel Boone National Forest Kentucky This past late fall I got to get back out and shoot at Red River Gorge where after all these years finally made the hike to Double Arch. I had originally planned on visiting the arch back in October but after an unplanned night of nearly a bottle of Makers Mark Whiskey my shooting intentions for the next day were somewhat derailed. I've really found photographing arches a very challenging subject and I will have to admit this one is one of the more difficult I've come across, from both sides. Double Arch sits high atop a ridge line, this side is the hikeable up close and personal side where the other side of the arch is a sheer drop off, but visible on the opposite ridge from the Auxier Ridge Trail. The only thing I really didn't like about this side was you couldn't see both arches from below as the other arch is a sliver directly above the main one. I'll have to admit it was worth the 2.5 mile hike out to see this beauty and I'm definitely looking forward to returning in the early summer and in the fall. 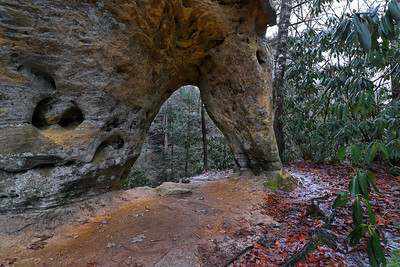 Grey's Arch Red River Gorge Geological Area Daniel Boone National Forest Kentucky The weekend I took this shot I did something I'd never done before, I made the journey from the rock house below Grey's Arch to it's base. 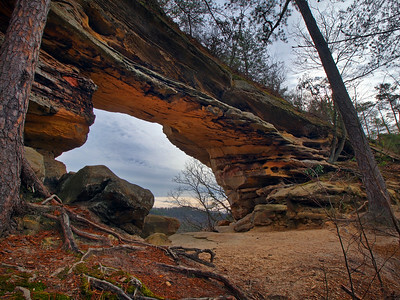 Located in Kentucky's Red River Gorge Geological Area in the Daniel Boone National Forest, I had visited the arch many, many times but I always was drawn to the view from the rock house and for some reason I never made the journey up. I know why, really. I didn't think it would look as cool at it's base as it does from below. Boy was I wrong, it's just as flipping awesome at the arch, as it is looking up at it from down in the gully. If you've never been, you are really missing out, I've never seen a landscape like it and when I first visited here my mind was blown. 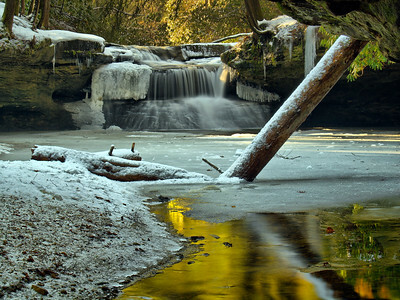 I just stood there in awe, basking in the beauty of this gorgeous natural formation. Although my perspectives were limited this time because of a blown out sky, I am highly motivated to make the return trip here again in the next couple weeks; early in the morning just as the sun hits the sandstone with a blue sky above. Mmmmmmmm, I can't wait! I was already in love with the beauty of this arch, but after making the journey up to have a closer look I now don't think there's an arch that will ever top it as my favorite. 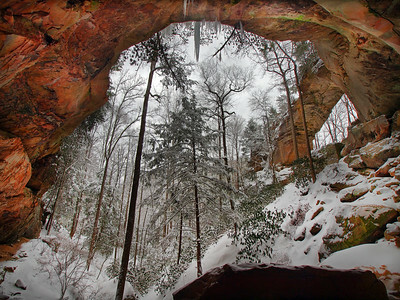 Gray's Arch Red River Gorge Geological Area Daniel Boone National Forest Kentucky Grey's Arch the day after 18 inches of snow fello. Read on for the long story of our adventure... It’s becoming obvious to me that I am having a hard time accepting the fact that I am now middle aged and not a young whipper snapper anymore. That being said, as many of you know a massive snowstorm made it’s way across the state of Kentucky a couple of Fridays ago in route to paralyzing the north east. Northern Ky didn’t get squat, where Rockcastle county in the southern section of the state was in blizzard conditions stranding 100’s drivers on I-75 for nearly 16 hrs. 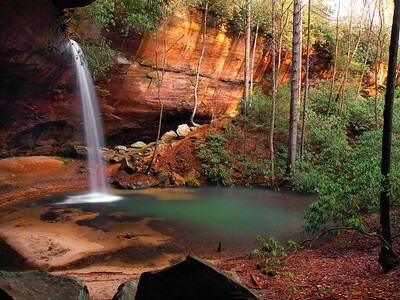 My good friend Chris and I had been talking all week of driving to Red River Gorge the following Saturday. Our initial plan was to hit the Rock Bridge Trail, but as the storm approached it became quite clear this weather event was going to be a doosy. Friday morning it was announced that all the forest roads in the Gorge were going to be closed, indefinitely, which made us change our plans. We decided to make the hike to Grey’s Arch. Friday night we were watching snowfalls totals, monitoring traffic cameras and snow plow GPS locations. I was on the fence about going, but that morning when I got up and rechecked everything, the snow was coming to an end and roads looked pretty good all the way to Lexington. We had planned on taking my 1987 Jeep Wrangler. I had recently put on a new soft top and had got the 4 wheel drive fully operational over the summer. Although I have owned it for over 11 years I’d never driven it far from home, it has always been a problem child. As soon as we hopped on I-75 it popped out of 4 wheel drive, at the time it wasn’t a problem, we stopped by Hardee’s for breakfast and reengaged it. The further south we traveled the more deteriorated the roads became, 75 was ok, 64 was worse and Mountain Parkway was sketchy. As we approached the exit for Slade we noticed that KY 15, oddly, was in far better shape than the interstate but the exit ramp was in awful shape. Our destination was one mile up a section of 15 that had sharp curves and a steep grade. Based on the clear condition at Slade we decided to make the effort. Our minds were blown. We couldn’t believe it. The road was completely clear. Once we arrived to Tunnel Ridge Road snow plows had mounded up snow at the entrance. So I just punched the Jeep through it. Bad idea, this caused the 4 wheel drive to pop out again, so I rocked the Jeep out and onto the road. I had brought a snow shovel and Chris used it to shovel out a parking spot while I drove around trying to get the 4 X 4 to engage to no avail, finally parking it in frustration. We were careful not to block Tunnel Ridge Road, even though it was gated, if there was an emergency, crews would still need to get in there. The hike ahead was 5 miles round trip, a little over a mile up the closed road to the trailhead parking area and then another 1.2 miles to the arch. As we crossed the bridge over Mountain Parkway it was evident that this was going to be a bit more difficult than we imagined, the snow was up to our knees, about 18 inches. Chris took the lead, but after a while we had to trade and we continued to trade back and forth as we made the approach to the trailhead. We were disappointed to see that we were not the first to be back here as a group of footprints had joined the road from the Sheltowee Trace National Trail. When we arrived to the Grey’s Arch trailhead we decided to take a rest on a picnic table. My left leg had begun to start hurting at my left hip and an old softball injury to my knee on the same leg was beginning to bother me as well. Chris had been feeling some pain for quite some time, but we’d made it this far we weren’t turning back now. It had taken us a little less than an hour to reach this point. 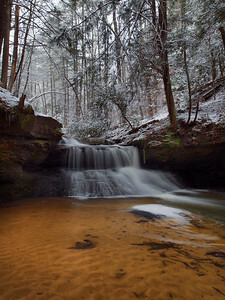 After about 10 minutes we resumed our trek, and when we reached where it intersected with the Rough Trail the footprints turned towards Martin’s Fork leaving beautiful virgin snow headed in the direction of Grey’s Arch. For the most part this next section of trail is level except for the last .3 or .4 of a mile as it descends sharply far below the arch. When we reached this stage of the trail we decided to shuffle our feet on the way down to create a better path through the snow. By now both of us were hurting pretty good, however the downhill trek was fairly easy, we just had to watch out for snow covered steps and fallen trees on the trail. Once we got to the bottom we rested up shooting the arch from deep inside the gully, and we also realized it took us two hours and twenty minutes to make the hike. Feeling rushed we followed the trail up to where we were right underneath it. This was where I really knew that the trek back out wasn’t going to be fun whatsoever, my left hip and knee were really getting to me now. We didn’t spend much time up at the arch, maybe 20 minutes, if that, because most of the perspectives involved a blown out sky. And so began our arduous trek out. On the way in I had cleaned off the steps pretty good so outside the fact it was a bunch of steps, it wasn’t too bad. Thank goodness we had shuffled our feet downhill, it helped with the pain a lot, but it still hurt. Once to the top of the ridge we figured it would be easy going but we were wrong, we had made only a partial impact on the trail and as we walked on the pain increased. For me it was becoming excruciating to lift my left leg and eventually I began dragging my leg more and more. I just kept thinking about sitting down in the Jeep for the entire remaining 2 miles and I pushed forward, letting the pain get to me was not an option in my book. When we reached Tunnel Ridge Road it was obvious several people had made their way back and a tromped pathway show it, although still painful, it was easier. I’m sure as we made our approach around the corner from the Jeep the family we passed playing in the snow probably compared us to zombie extras from the show The Walking Dead: two guys, exhausted, dragging their feet and trekking poles who can barely muster a “hello.” I think the worst part was the final 200 ft. as we walked the bridge over Mountain Parkway, the snow was deeper there. Finally relief! I hopped in the Jeep, started it up, jumped back out, dusted the snow off, took off my Yaktrax, waited for it to warm up, and off we went down 15 towards Slade. It was quite clear I’d messed the 4 wheel drive when I busted over that drift, I got it to work where I needed it to but after a short time it would pop back out. You’d think this adventure would end there, but it did not. Once on Mountain Parkway it was freezing. The soft top was allowing too much air in but the heat was working fine. At our feet it was 100 degrees and at our heads it was outdoor temperature, we could clearly see our breath. To say the least, the journey to Winchester was a cold one and we decided to stop by Applebee’s to grab a bite to eat and warm up. Again, things didn’t plan out as we would have thought. Once inside and we took off our outer layer of clothing we were both soaking wet underneath, so sitting inside a 70 degree room we were shivering cold. I will commend the servers at the restaurant, they brought us some coffee for free after dinner to warm us up and it worked. First time in 20 years I’ve drank coffee. While sitting there I told Chris we need to find a Kohls or a Wal-Mart. We still had over 100 miles to drive and it was going to be an awful ride unless we bought some fresh cloths. Luckily there was a Wal-Mart about a mile down the road. Back into the icebox we went. After arriving at Wal-Mart I found some replacement gloves (mine were soaked on the inside), I found a turtle neck shirt ( I never wear them), and I found a nice fuzzy lined flannel jacket thing. When checking out I explained to the cashier was going into the restroom to change and she looked at me like I had 5 heads. So in I went, some lucky guy got to see me shirtless in there. With a new upper layer of clothing on Chris and I jumped back into the jeep and began the ride home. The new digs made all the difference in the world. Once we made it Sadieville on I-75 I noticed the icebox on wheels was a bit warmer and asked Chris if he noticed, which he had. He looked at his phone and turns out it was 3 degrees when we were at Winchester and it was 26 where we were then. What a day, one that was worth the trip, the suffering and the cold. I will say this, I’ll never hike in 18 inches of snow ever again. Hard to believe that it was year ago January 23, 2017 that myself and my good friend Christopher Morris and I made the 5 mile knee deep round trip hike to Gray's Arch in the Red River Gorge after 18 inches was dumped on central/eastern Kentucky. At times during the trek it seemed like one of the dumbest things I've ever done but looking back it was an adventure of a lifetime where I pushed myself to my limits to see one of my favorite places as few have. But the hike in the snow was half the adventure, as temps plummeted during the hike when we arrived back to my 1987 soft top Jeep Wrangler. Being soaked from sweating and driving 65 mph down Mountain Parkway on the way home as it was 5 degrees outside made for a cold, cold return ride. We even stopped at Wal-Mart after 40 miles on the road and bought dry cloths and changed in the bathroom. Oh, and I forgot to mention that I ruined my 4 wheel drive busting through a snow drift. What a day, one of my favorites!